President Donald Trump speaks during a Cabinet meeting at the White House, Jan. 10, 2018, in Washington. This year, 2018, promises to be one of challenge and opportunity for President Donald Trump, both domestically and overseas. Trump hopes to build on his victory on tax cuts late last year. But the president and his Republican allies in Congress will likely face strong political headwinds this year leading up to the November midterm congressional elections. Even as he looks ahead to his second year in office, Trump likes to remind everyone about victory last month on a tax bill. 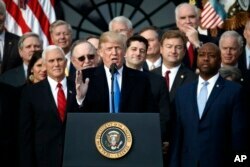 “It is going to be tough to beat the year we just left because what we had last year was something very special, especially to cap it off with the tremendous tax cuts and tax reform,” Trump recently told reporters. Trump’s White House got off to a rocky start this year with publication of the controversial book, Fire and Fury: Inside the Trump White House by Michael Wolff. The book’s highly critical assessment of the president set off a political firestorm and raised questions about his fitness for office, especially among Democrats. Trump and his aides slammed the book as mostly fiction. “There are numerous mistakes, but I am not going to waste my time or the country’s time going page by page talking about a book that is complete fantasy,” said press secretary Sarah Huckabee Sanders during one exchange with reporters at the White House. FILE - President Donald Trump speaks during a bill passage event on the South Lawn of the White House in Washington, Dec. 20, 2017, to acknowledge the final passage of tax overhaul legislation by Congress. Republican congressional leaders including House Speaker Paul Ryan would prefer to talk policy, not personality, especially in the wake of the tax cut win. Analysts say the furor over the book has once again sharpened the political divide over the president. Despite the victory on taxes, Trump remains historically unpopular for a first-year president. The latest Quinnipiac University poll this week found his approval rating at 36 percent while 59 percent disapprove of his presidency. The survey also found voters prefer Democrats to take over control of the Congress next year by a margin of 52 to 35 percent. Several veteran Republican lawmakers have announced their retirement in recent weeks, adding to what many experts are predicting will be a Democratic wave in November. “I think Republicans will have to confront the fact that there is more enthusiasm on the Democratic side than perhaps there is on the Republican side, in part because President Trump is and remains quite unpopular,” said Molly Reynolds with Brookings. The New York Times noted this week that when a president’s approval is under 50 percent, the president’s party has an average loss of 40 House seats in the midterm. Democrats need a net gain of 24 House seats to retake control of that chamber, and two seats to take the majority in the Senate. FILE - President Donald Trump stands before speaking at a rally at the Phoenix Convention Center, Aug. 22, 2017, in Phoenix. Trump still has confidence in himself as a campaigner, and Northeastern University expert Costas Panagopoulos said the president might be energized to aggressively campaign in the midterms later this year. “This is where we see Trump excelling most, or at the very least, his passion and his interest seems to lie in the game (of politics), in the campaigning process,” Panagopoulos said in a Skype interview. Other analysts see the president’s often chaotic leadership style as adding to his challenges in 2018.